Cat wears a terrible dress. Some other stuff happens, but it’s hard to remember anything apart from Cat wearing a terrible dress. Then again, presumably Barbara chose it and her brain has been well and truly pickled by gin. So poor old Cat must go to the ball looking like Dr Frankenstein’s attempt to create Tinkerbell. So, trying to put that ghastly sight out of mind, what else did “Under The Knife” have to offer? A lot of knives, for a start (see “Extras” below). Ostensibly the episode title may have been referring to the Ogre’s plastic surgery, but plenty of other people (and, indeed, innocent melons) were threatened by blades this week. The knife giveth, the knife taketh away. Or something… It certainly made for a very (knife-)edgy 45 minutes. There’s also an awful lot of foreshadowing for Gordon’s and Bruce’s future working relationship. There are parallels between Batman and the Ogre creating masks for themselves, and Bullock’s line to Jim “You can’t be held responsible for the actions of a psychopath” couldn’t be more pointed. All of which might have more impact if Bruce looked at all like he was going to become the Batman of Dark Knight mythology. Unfortunately at the moment he looks more like he’s going to grow into Hugh Grant’s take on Sherlock Holmes. His and Selina’s scenes at the ball were so stilted it wasn’t clear if they were supposed to be funny or endearing. They ended up just a little embarrassing, to be honest. Then again, the dance scenes between Ogre Jason and Barbara – despite one very Hitchcockian cut from a flashback to Jason’s predatory stare in the present – lack the dramatic sweep and visual elegance ballroom scenes can achieve. Maybe the director just ain’t go no rhythm in his soul. The Wayne Ball takes place in the Fledermaus Gallery. Fledermaus is German for bat. These quibbles aside, this was a vast improvement on the previous episode. The Ogre definitely feels more of a threat now, even if he is a bit too obviously “Fifty Shades Of Gotham”. Milo Ventimiglia is so convincing as a psycho killer it’s going to be difficult to accept him as one of the “heroes” ever again. There are also key moments for the show’s “dubious duo” – Penguin and Ed. Nygma has now officially gone to the dark side. Admittedly, the cop he kills was a woman-beating scuzzball, but Ed’s maniacal giggling after the stabbing session suggests that Gotham’s Riddler is going to be every bit as dangerous as the Penguin. And more unhinged. 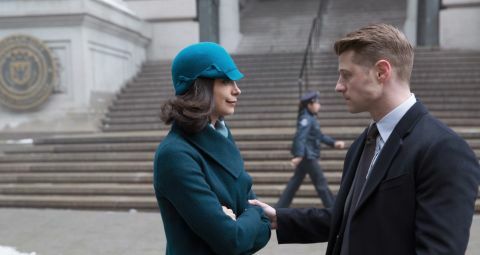 Penguin, meanwhile, now has another reason to loathe Maroni after the odious gangster boss asks Gertrude Kapelput if she’s in denial about her murderous son. It’s a deeply unsettling scene, Maroni wounding Penguin more deeply than ever before and all without the aid of a gun. The strange thing is, by the end of the episode you’re still not sure if Gertrude is hopelessly gullible or wilfully blind. The fact that, when Maroni sends flowers, Penguin decides to shoot (well stab, to be precise) the messenger right outside his mum’s front door suggests that he’s not exactly worried either way, as long as the status quo is maintained. The only real major problem with the episode, then (well, apart from the dress), is the fact that you can’t help hoping the Ogre does kill Barbara. Since her chief role in the second half of the season has been fashion adviser to Selina, she’s eminently expendable. Maybe next week? And did we mention the dress? Oh look, both of Gordon’s girlfriends have trouble with stray cats wandering into the apartment. Has Harvey Dent got shares in this place? …Then we get Ed giving some melons a good mashing (file also under: “Foreshadowing”). After that, the Ogre prepares for a night out in true serial killer style. He later produces the same knife when Barbara takes him back to her apartment. Not sure if plastic cocktail sticks in the shape of swords strictly count but it’s too good an image not to use. Bullock uses a knife to cut down the Ogre’s dad. No actual knife appears, but Maroni asks Penguin’s mum, “What kind of person plunges a knife into someone over and over?” Is that a riddle? The Ogre takes an interest in Barbara, Moroni takes an interest in Penguins mother and Cat wears a terrible dress.